Clea gets easily distracted but she’s always been able to cope and get her work done up to now. But in seventh grade the work has gotten more difficult and her systems for coping can no longer keep up. She’s not finishing her assignments and she’s failing tests. Her parents are worried, but Clea figures that she just needs to double down – work harder and stop being so dumb. If she doesn’t figure things out, she risks getting kicked off the chess team – the one thing at which she’s actually good. A counselor at school suggests to Clea’s parents that she should get tested for ADHD. That seems unlikely to Clea since she’s not hyperactive like those kids usually are, but her parents insist. When it is found out that she does have ADHD, she is shocked but slowly comes to welcome outside help. But even with medication and special accommodations, she finds it is still going to be hard work to overcome her condition. 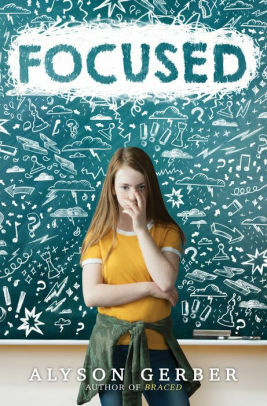 A dense middle grade reader about ADHD and what it is like to cope with it. I don’t generally like books that are basically non-fiction cloaked in a story. They seem too preachy to me and more work than fun. The characters just sound like they are taken off the pages of an encyclopedia with long speeches full of facts that are unlikely to roll off the tongue. Clea's character does get to hang with friends, have a romantic crush, and deal with a fairly ineffectual bully, but it’s thin framework upon which to drape the factual information that Gerber really wants to talk about.